Employment opportunities for students with BS degrees in Earth and Environmental Sciences are generally good, and because energy, the environment, and sustainability are issues of increasing importance to the public, the future looks excellent. The U.S. Department of Labor – Bureau of Labor statistics predicts a 16% increase in jobs in geoscience fields and a 15% increase in jobs in environmental science fields over the next decade, higher than the overall average growth of 11% for all occupations in the United States. For a recent article on job growth in the field, see: Geosciences: Earth works. Another good site to look at for a review of current status of jobs in the geosciences is that of the American Geosciences Institute. 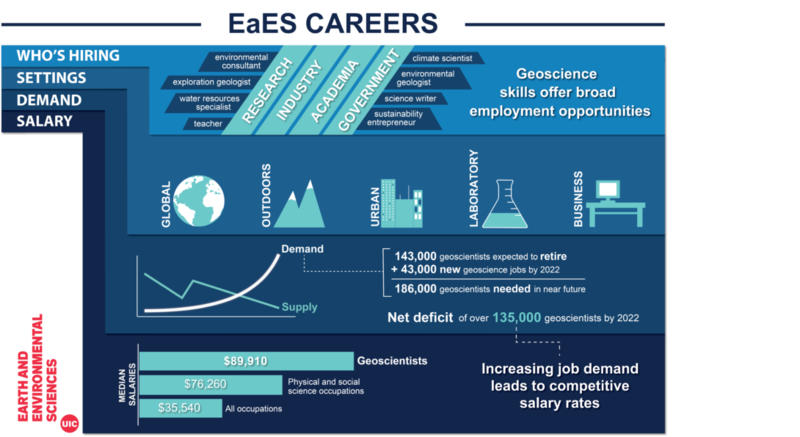 They have a terrific Careers in the Geosciences brochure. The American Geophysical Union also has a great online Career Center. The Office of Career Services (OCS) located in Room 3050 SSB (1200 West Harrison street) can help you find information on career issues. OCS provides various services including assistance in resume writing, resume referral, employment searching. OCS publications include helpful advises on good practices during job search. OCS regularly offers career preparation seminars. You should provide the Office of Career Services with your resume prior to your semester of graduation. Database for on- and off-campus jobs and internships. Upload your résumé and apply for jobs in the federal government. International job board for a broad set of Earth and geoscience fields. Career opportunities and scholarships are posted through this AGI publication. For students interested in summer internships, graduate school, and fellowships. Environmental or engineering consulting firms in Chicago area (estimated to be more than 100) and throughout the US hire a significant number of earth science students at all levels. Most small or medium size companies, however, tend to take their new hires at entry level. In general, students who have internship or similar work experiences would have better chances to find jobs in the environmental consulting industry. As a rule of thumb, good communication skills and a little field experience always help. Environmental protection has created many jobs, particularly at the federal and state level. In addition, many municipalities hire geologists to manage water resources and recreational parks and to evaluate building sites and highway routes. The federal government hires bachelors, masters and Ph.D. level geologists for positions in a variety of agencies all over the U.S. Agencies include the Bureau of Mines, Bureau of Land Management, Department of Transportation, U.S. Environmental Protection Agency, U.S. Forest Service, and the National Parks. If you’re interested in working for the government, check out the Federal Jobs Information Center website at https://usajobs.gov/. This industry is highly dependent on the world market and highly cyclical, varying greatly from year to year. They are currently hiring well trained students. We urge students who are considering careers in industry to enroll in a traditional geology based summer field camp. For those who may be interested in employment prospects in this area, the National Academies Press has just published: Emerging Workforce Trends in the U.S. Energy and Mining Industries: A Call to Action. Aside from environmental problems associated with engineering projects, engineering geologists are hired to evaluate soil and rock foundations and evaluate potential sources of building materials. Engineering geology, and hydrogeology are specialties properly learned only in graduate study. Many of our students have found jobs at local consulting companies. Attendance at the local meeting of the AEG is a great way to network. The oil, gas, and coal industries have been the traditional employer of most geologists. Most companies hire people with at least a Masters degree, and with a strong background in mathematics, computer programming, stratigraphy, geophysics, and field methods. We strongly urge you to take a formal geologic field course if this is your desired goal. AEG is a professional organization serving professionals in engineering, environmental, and groundwater geology. Students can join for free! The North Central section has monthly dinner meetings, many of which are held nearby in Greektown. Students can attend at a substantial discount. This is a great place to network! Meetings will be posted and e-mail notifications will be sent by the Undergraduate Director. Most professional organizations in the Earth and Environmental Sciences offer a student membership category at a substantially reduced rate. Student membership offers perks such as subscriptions to journals, reduced costs to attend meetings, job and internship announcements, and access to research and other awards. Membership is also a great way to become familiar with the field and with programs at other institutions. Some organizations to consider, and to which many of the EaES faculty belong, are the Geological Society of America, the American Geophysical Union, the Geochemical Society, the Mineralogical Society of America, the Clay Minerals Society, SEPM (Society for Sedimentary Geology), the American Chemical Society-Geochemistry Division, and the Paleontological Society.